In his appearance on May 12th’s Another FN Podcast With Izzy Presley, Tracii Guns opened up about everything while not only telling us that there is a Devil City Angels record in the can and they will be shooting a video in June along with Gunzo dates and new music from them in the future, but he also talked about his relationship with Phil Lewis of LA Guns. “Phil and I never really had any real bad blood, we had some cat fights and stuff like that” Tracii said. “There is actually a little plan right now where him and Gunzo may actually do something out of the country for a minute together, so there is all kinds of possibilities, but the reality of what Phil or I would call an L.A. Guns reunion, that probably won’t ever happen. but there is good chance you will see even possibly new music from Phil and I certainly at some point. As long as we are living we certainly will be on stage again at some point together” he continued. 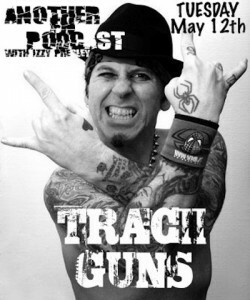 When asked what it was like to get on stage with him after 11 years at a Sin City Sinners gig in las Vegas, Tracii said it was very comfortable and they both do L.A. Guns very well. They had been in touch because Phil had just moved to Vegas and Tracii was living in a hotel while working a gig there for a year. Phil has since joined Gunzo on stage for Ballad Of Jayne in Vegas in April. Tracii also talked about the early days when Axl Rose was in L.A. Guns, how Guns & Roses was formed, and the laugh that Axl got when Tracii offered his services to Gun N Roses in the early 2000’s. He was also asked about touring as L.A. Guns and having two versions of the band. He said it never felt like L.A. Guns. When people see a guy who used to be in a band playing the music he created with different musicians in a live setting it is cool but if you are using that name and the voice is different, people want to hear the voice. Listen to entire interview at here. Tracii joins around the 50 minute mark. Funny, just last night I played the first LA Guns cd. I haven’t in quite some time. Really strong material that still holds up. Phil’s vocal approach is pure rock n’ roll. Tracii left a big impression on me when I saw them open for AC/DC in ’88. What a scorching guitar player and hell of a showman. I’d love to see Tracii and Phil work together again. If they do, I hope they record a record of blistering rock and roll! The first two LA Guns albums are both really solid 80s hard rock records. This band really should’ve been as big as Ratt, Quiet Riot, Dokken, etc. From their appearances on TMS in recent years, it seems like Tracii’s biggest beef is with Steve Riley, not Phil Lewis.